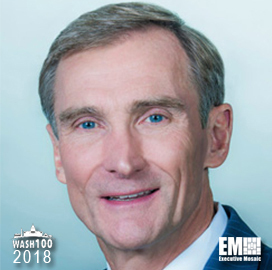 Executive Mosaic is honored to introduce Leidos Chairman and CEO Roger Krone as an inductee into the 2018 edition of the Wash100 — Executive Mosaic’s annual selection of influential leaders in the government contracting arena — for his excellence demonstrated through expanding the company’s portfolio as a solutions-based organization. The nearly 40-year aerospace industry veteran was appointed Leidos CEO in July 2014 after working as president of network and space systems at Boeing. Krone is a five-time Wash100 inductee and was included in the 2017 list for leading Leidos through its merger with Lockheed Martin‘s information systems and global solutions arm in 2016. The Leidos CEO made the 2016 Wash100 selection for his growth strategy and financial performance leadership efforts. At an event hosted by the Northern Virginia Technology Council in October 2017, he said the merger helped Leidos diversify its portfolio, boost its market presence and expand its cloud computing and enterprise information technology modernization offerings. “Today marks the next step in the evolution of Leidos. I’m excited about where we came from and what the future holds,” Krone said the day of the merger. Krone was also recently named to Federal Computer Week’s 2018 Federal 100, recognized for his efforts in supporting the federal government IT community. Under Krone’s leadership, Leidos has increased opportunities for its employees, customers and shareholders, developing solutions that deserve to be recognized in the community. The Georgia Institute of Technology named its engineered biosystems building after Krone and his wife Helen in June 2017, where advance research will be conducted in biosciences and biomedicine to help find treatments for chronic diseases.